With several machines I have installed 15.10 beta on and in several cases I experienced the problem that the swap is not activated at boot time and that /dev/disks/by-uuid does not contain a link to the swap partition, and the previously created luks-encrypted swap is destroyed after boot: It is not a luks partition anymore and filled with random (presumably encrypted) bytes without structure. I first thought that this is a problem of the setup process, and repaired the swap manually. But then I found the partition destroyed again. This happend several times on several machines. I am not sure yet what exactly would destroy the partition. The systemd package has taken over the handling of /etc/crypttab at boot from cryptsetup (without much coordination AFAICS), and it sounds like its interpretation of the crypttab is buggy. "swap" is not synonymous with "random", and should not result in the device being clobbered, which is what is happening here. In particular, encrypted persistent swap needs to be supportable for users who wish to use this for suspend to disk, and this requires a LUKS header (with UUID). Note however that for this use case, you *also* don't actually want to use 'swap' as an option in /etc/crypttab, because this is defined as "Run mkswap on the created device", and there's no need to do that if you have a persistent crypted swap. Well, life would be much easier if there was some usable documentation about what's going on within systemd. By the way, I did not put in that 'swap' option manually, it was inserted by the xubuntu 15.10 beta installer on cdrom/usb image. If you choose to encrypt a partition and put a swap inside, it automatically adds that swap option. So at least this crypttab option, the behaviour of the installer, and systemd don't fit together. Since you mention it: On my other machine with 15.10 I noticed the problem that the machine does not recover from hibernate, but performs a fresh boot, which meets your hint, that wake up does not work with that style of crypt swap. whatever it is what fills the device with random data, should honor the luks option in the crypttab and use this thing as intended (i.e. configure the device mapper and do a swapon). I tried to reproduce this on today's ubuntu desktop amd64 image (20151014). I think I set up partitions like you described: 1 GB /boot on partition 1, 1 GB LUKS on partition 2 (and put swap on vda2_crypt), 8 GB LUKS on partition 3 (and put btrfs / on vda3_crypt). The only change was in the UUID of vda2_crypt as that gets re-mkswap-ed every time due to the "swap" option in crypttab. If that's undesired, this needs to be fixed in partman -- however, it doesn't sound like that's the actual issue you see. So I can't reproduce "destroys swap partition" just yet. From your description it sounds like something is destroying sda3 itself (i. e. the outer encrypted LUKS partition), *not* the unencrypted sda3_crypt, right? - What do you precisely do to "repair the swap manually"? - After that, please copy&paste the output of "sudo blkid", "sudo swapon -s", "cat /etc/crypttab", and "cat /etc/fstab". - After that, please copy&paste all of the above commands again, so that we can compare. - Run "sudo journalctl -b > /tmp/journal.txt" and attach /tmp/journal.txt as well. > From your description it sounds like something is destroying sda3 itself (i. e. the outer encrypted LUKS partition), *not* the unencrypted sda3_crypt, right? I've created the partitions with the graphical xubuntu installer from xubuntu 15.10 beta 1 cdrom put on a usb stick, and created both sda2 and sda3 as encrypted volumes, then put a swap in sda2_encrypted and btrfs in sda3_encrypted. This worked well with 14.04. After booting I've realized that the machine had no swap, even no links to the partition under /dev/disks/by-uuid, and thus could not open the device manually. I found that the partition was completely filled with random data, no luks header. cryptsetup isLuks said it is not a luks device, and xxd should no trace of a luks header anymore, completely overwritten. I assumed it was a problem of the installer, not of the running system. My first suspicion was a corrupted partition table, but I did not find any problem with the partition itself. My next suspicion was a fault in the storage device, since I had replaced the old hard disk with a brand new SSD for the fresh install, but except from that problem I do not see any problems with storage, and I experienced these problems on two distinct machines. I do not see any problems on the other partitions and their file systems so far. > - What do you precisely do to "repair the swap manually"? On one of the two machines (office machine, I'm using right now) this helped and the problem did not reoccur so far. That's why I first assumed that it was just a problem of the installation process (graphical xubuntu installer), because I had experienced more trouble with the installer used in the lubuntu 15.10 beta cdrom image. I'll reply to that once I am back home at that particular machine. OK, I am back at my home machine: The problem occured again, the machine destroyed again luks on /dev/sda2. Furthermore, I have another problem: When doing a regular boot, but boot process hangs after systemd listed the names of several services (in most cases networking.service is the last printed, which is not quite useful, since these are, as I understand it, finished services, not the once that cause trouble. I did not yet find a way to make that damned systemd tell what it's doing. Strange enough, the machine boots without problems if I choose there recovery mode, choose to aktive network from the menu, and then go on, so it works when recovery mode is part of the boot chain. I guess Ubuntu will have lots of fun with that systemd. I'll now repair the partition as described, reboot and come again. OK, freshly rebootet. This time, sda2 has survived as a valid and operating luks partition. crypttab and fstab not changed. > This time, sda2 has survived as a valid and operating luks partition. Then the journal won't show the bits where it destroys it (but it's still useful for comparison). I'd like to see a journal when it does destroy the device. One way would be to just keep rebooting until that happens. You can try running this several times until it destroys your partition (FTR, I ran it successfully some 20 times). Does that reproduce the bug for you? If so, please copy&paste the output from the command cycle that did the destruction. If not, then I guess it's something else in the boot process, and then please reboot until it happens and attach the journal output from this boot. Please file a separate bug report about that. /usr/share/doc/systemd/README.Debian.gz describes how to debug such shutdown hangs. In particular, boot with enabling the debug shell, and when it hangs switch to it and check for running services and also save the journal. Thanks! I've noticed something and I guess that both my problems - swap problem and systemd hanging while booting - are closely related. The system does not hang at boot, when I choose the recovery mode from grub, and in the recovery mode select "network" to enable networking. Important: before activating the network, the console asks me to enter the password for sda2_crypt (swap). System then can boot up the regular way. So it seems to be something in the systemd service order. The recovery menu's network option does something, the normal boot sequence doesn't. I have debugged this down and got big steps further in identifying the problem. An important step for debugging was to learn how to debug systemd. helps a lot. After that, one can get a root shell when the systemd boot process is hanging. hangs. It waits for password input, but for some reason it's prompt and input don't make it their way to the boot console or boot splash prompt. There's a problem with the procedure for requesting a password. Killing that process from the debug console makes the boot process continue immediately (of course without working swap). Once knowing that this is the process causing trouble, debugging get's much easier, since it is not required anymore to try this within a boot process. You can use a running machine with any test partition for easy debugging. So one knows what happens right here. You can easily call the given command from anywhere as root with any partition, without the need to edit /etc/crypttab, because it's all command line parameters here. Makes testing pretty easy now. That damned systemd-cryptsetup ignores luks (or is unable to cope with modern luks settings). This looks good, because it's the same crypt-parameters (aes-xts) as I used when creating the luks partition, and it uses an offset of 4096, allowing the luks header to remain untouched. - it's an offset of 0, which overwrites the luks header. That's why I am seeing garbage again and again. - no offset, thus overwriting the luks header. so the swap argument overwrites the luks argument and resets the ecryption type to plain. (i.e. just change the order of the parameters, use swap,luks,discard instead of luks, swap, discard , as the ubuntu installer creates, it works and uses the luks partition correctly. OK, I've finally found the problem(s). Was a bunch of little nasty problems, that's why it was difficult to debug. 2) That's why /usr/share/initramfs-tools/hooks/cryptroot did not mention the device in /conf/conf.d/cryptroot of the initramfs. Once it is correctly mentioned in this file (after fixing bug 1), the password is fetched and the device is opened at the initramfs phase, i.e. before systemd takes control. This works well. 3) If sda2_crypt is not mentioned in the initramfs' /conf/conf.d/cryptroot, it is not opened while initramfs has control. But then, once systemd takes control, systemd tries to open it since it is listed in /etc/crypttab. But this does not work, since both systemd and plymouthd have bugs. plymouthd can go into an endlesss loop or completey fail, depending whether you have splash/graphical boot or textual. Once bug 1 and 2 are solved, this issue does not occur anymore. 4) But then, system hangs while booting for another reason. systemd still tries to create a swap device and hangs forever. I could not reliably figure out why, but it looks as if it waits for systemd-cryptsetup for to do some things which it doesn't do since the crypt device is already open. 5) Finally seems to work. Just for the notes: systemd (and plymouth) is so buggy and intransparent that it is far from beeing production-ready. That cost me several evenings of work and headache. 1) putting the swap flag into /etc/crypttab -> crashes the partition every now and then, but not always. /etc/initramfs-tools/conf.d/resume: Everything works well , but a) initramfs asks for the password twice (once per partition), which is sort of annoying, maybe the password sharing scripts coming with cryptsetup might work (didn't try yet with 15.10). 3) as 2, but removing /etc/initramfs-tools/conf.d/resume: Interesting effect. The bootprocess asks for password only once for the root partition(! ), but systemd nevertheless mounts the swap partition as a second luks device without needing the password. Source code says something about a password cache, so the password from the root device seems to be cache for some time and accessible. Nice, but resume from hibernation does not work. 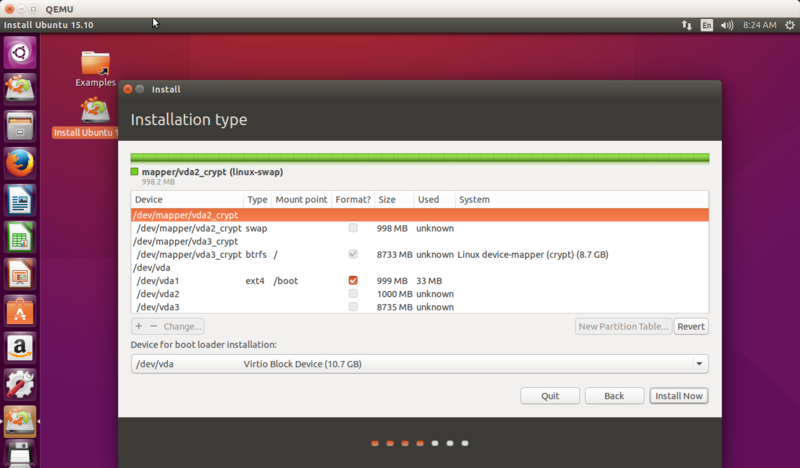 Unfortunately the ubuntu installer produces mode 1, which does not really work. This mess should really be fixed for 16.04 LTS. In my eyes it's a major problem of systemd, but the initramfs code could also be extended to use the password cache (which is there and caches anyway) to avoid asking twice. I'm also having this issue with Ubuntu 16.04.2.